Ever since it was revealed that the NSA had monitored German Chancellor Angela Merkel's mobile phone and Brazilian President Dilma Rousseff's emails, the Chinese public has been waiting for the other shoe to drop. 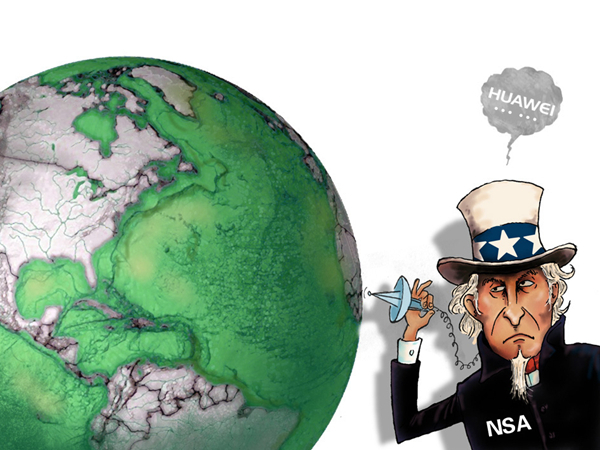 How closely has the NSA been watching China? Now the shoe has dropped, and things are worse than expected. According to documents published by Der Spiegel and New York Times, the NSA's Chinese targets covered the whole spectrum from former President Hu Jintao and Huawei CEO Ren Zhengfei, through the ministries of commerce and foreign affairs, as well as the entire banking and telecommunications sectors. Of course, NSA surveillance in China has an element not present in the German and Brazilian cases. Immediately prior to being caught red-handed, the United States had been raising a hue and cry about Chinese hackers targeting America, i.e., accusing China of doing precisely what it was doing to China. The allegations are still ringing in our ears. According to the logic used by American experts and spin doctors, cyber attacks on critical systems pose imminent threats comparable to terrorist attacks. Now their rhetoric has backfired on them. In fact, no country has ever contemplated launching a Pearl Harbor-style cyber attack on the United States. But the United States has been hacking other countries' networks for years. Stewart Baker, a former NSA cyber expert, exemplifies the American mentality: "It's clear we have enemies who'd love to attack US critical infrastructure…It may not happen soon. But we would be crazy to assume it will never happen." Speculating that others might initiate cyber attacks on the United States, the NSA decided to preemptively target the entire world. Sadly, what we can do about this aggression is limited. What was once considered to be a beacon of democracy has changed overnight into a police state sniffing out every tiny scrap of information while claiming to be acting in defense of freedom. And the rest of the world just has to live with it. So long as influential world media organizations remain in American and European hands, the chances of Chinese feelings about the NSA being heard, let alone understood, are slim. What is more, the American public simply refuses to listen. When secret documents about the NSA eavesdropping on Chinese officials and targeting the servers of Chinese telecom companies were revealed, the typical response ranged from "no big deal" to "good job". There were broadly similar reactions in the American press, with some commentators going so far as to denounce those who revealed the snooping as traitors. This was an eye-opener that genuinely astonished the Chinese public. Freedom lovers in China need to wake up and re-orient themselves.